Hospitality student Spencer Fee has had a running start toward his future career as an event coordinator in more ways than one. As a child growing up in Freeland, Washington, he was naturally drawn to orderliness and liked to be in charge of organizing his family’s schedules. These qualities led to leadership roles in high school and volunteer organizations. He enrolled in his school’s Running Start program to earn college credits and was working at the Inn at Langley when he realized event organizing could be an amazing job. One of Fee’s most influential mentors was a former teacher who became an event coordinator with Odigo Group, a vendor that contracts with Microsoft. Fee secured the internship and within three months earned a paid position. By age 19, he held a high level of responsibility within the firm and enrolled in the hospitality program at WSU Everett as a junior. Fee is one of the most involved students in the WSU Everett SHBM program, working to make a positive impact on students, staff, and communities. He cofounded and is the vice president of the Epsilon Chapter of Sigma Iota—WSU Everett’s first business club. 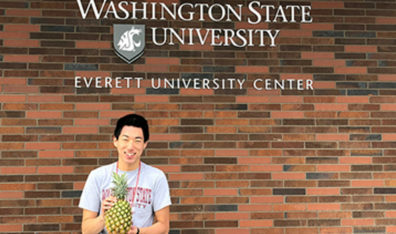 He is also an SHBM ambassador and a senator for Everett’s ASWSU, representing his fellow business students in the Associated Students of WSU legislature. In spring 2018, Fee received a $3,500 PCMA Education Foundation Legacy Society scholarship, an award recognizing students who are in their final year of undergraduate education, committed to becoming an event organizer post-graduation, and have a minimum 3.5 GPA. In addition to tuition assistance, the PCMA scholarship comes with several other benefits such as a three-year membership after graduation, training opportunities, access to industry networks, and more. “The PCMA Scholarship, combined with the Carson College SHBM Dwight & Beverly Call Scholarship and the Everett Scholars award, enables me to continue my education and pursue my passion for events and project management with a decreased burden of debt. I hope to one day do the same for someone interested in starting in the industry,” says Fee. His goal is to work for Microsoft in corporate events or perhaps become a strategic marketer for a company like Microsoft or Alaska Airlines. To learn more about how you can support a hospitality business management student, contact Nancy Swanger, director of the School of Hospitality Business Management, at swanger@wsu.edu, or 509-335-2443 or Jeff Pilcher, director of development, at jeff.pilcher@wsu.edu or 509-335-8906.